Notes to Meditations on 84: Whose Song Do You Sing? 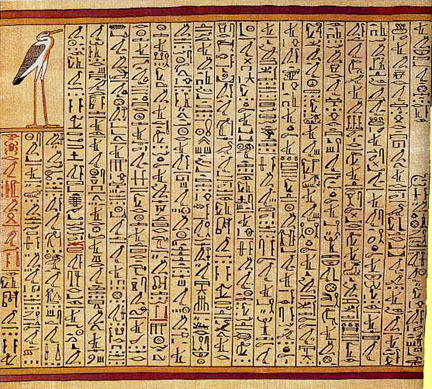 The source of this image is from Chapter 84 in Papyrus of Ani: Egyptian Book of the Dead: Chapter for being transformed into a heron "I am held in respect to the breadth of the sky, my strides are towards the towns of the Silent Land." The heron is a solar bird which shares much of the symbolism of the stork and crane; it is also vigilance and quietness. It is also a bird of the waters. In Egyptian mythology, the heron is the first transformer of the soul after death. The Bennu is thought to have been a species of heron, or possibly the phoenix, as it is also symbolic of the rising sun, regeneration, the return of Osiris, as the bird of the flooding of the NIle and renewal of life, since it leaves the river and flies over the fields when the Nile rises. (J.C. Cooper, An Illustrated Encyclopedia of Traditional Symbols 1978, p. 83). The Silent Land is a metaphor for death or afterlife the Bardo state after death and before rebirth. Longfellow has a poem Song of the Silent Land" which ends "To the land of the great Departed, / Into the Silent Land!". Just as sunset signals the death of daytime, sunrise signals the rebirth of morning. Hence, the next line of this poem "orange sunrise beyond the mulberry grove". I've borrowed this image from Wang Wei's Poem 84 "The sun is hidden beyond the mulberries / and the river gleams between the villages." The three colors of the mulberry's three stages of ripening, white, red, and black, are used to symbolize the three stages of man's life: white, the innocent child; red, the active youth; black old age and death. In China, the mulberry is a Tree of Life and has magic powers against the forces of darkness. It also represents industry and filial piety. (J.C. Cooper, Encyclopedia of Traditional Symbols 1978, p. 110). Thus, beyond man's transitory life of birth to death, is the eternal sun (soul) timeless beyond day and night. And between the villages (man's habitat), the River of Life (Spirit) is always gleaming and flowing. 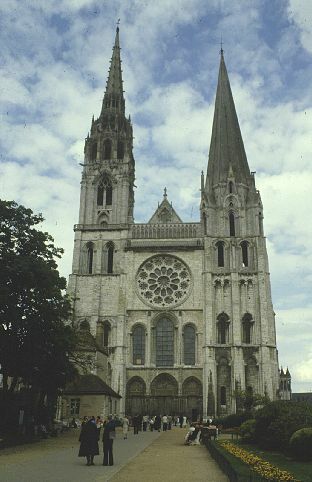 In Duino Elegies, VII.81-84, Rilke writes: Chartres was great, and music / reached higher still, transcending us,". The feeling of transcendence is evoked in the opening lines of George Oppen's poem "Chartres": The bulk of it / In air. In place of Rilke's "and music reached higher", I'm specifying Beethoven's Last String Quartets (Opus #127-135 composed 1816-1826) as equally if not more inspirational. Read J.W.N. Sullivan's Beethoven and his Spiritual Development on the transcendental quality of Beethoven's last compositions. Listening to them, we feel sky-borne and a deep inner peace pervading our entire being. Beethoven once confided to friend Karl Holz that that while all of his sixteen quartets were unique, "each in its way," his favorite was the C sharp minor, Op. 131. Prof. Manfred Clynes said, "anyone who has heard Beethoven's Last Quartets tends to become stronger." The source of this line is from the Rig Veda, Book 5, 84.3 (c. 1500 BC) in a song of praise to Prthivi, the Earth Goddess: "When from the lightning of thy cloud the rain-floods of the heaven descend." I've adapted it here to conjure the opening lines of Genesis: "And God said, Let there be light." In a cosmology context, this is the image of the Singularity where this entire universe is born in a Big Bang from a single dimensionless point of Nothingness. The singularity theme is present in the 2nd, 3rd and 5th stanzas of this poem images of Emptiness, Infinite Zero, one dark space, and sheer nothingness. Yet, out of this Nothing, comes the first light reminiscent of Wordsworth's Intimations of Immortality from Recollections of Early Childhood: "But trailing clouds of glory do we come	/ From God, who is our home"
The pearl of great price comes from Matthew, XIII.45-46 when Christ compared it to the kingdom of heaven: Again the kingdom of heaven is like unto a merchant man, seeking goodly pearls: Who, when he had found one pearl of great price, went and sold all that he had, and bought it. Gaskell in Dictionary of All Scriptures and Myths (1960) compared the merchant to the ego or lower self, and the pearl to the Higher Self. When we get a glimpse of the Cosmic Self, we abandon the petty desires of the illusory ego for the experience of our true Eternal Self. In her poem "Flare" from The Leaf and the Cloud (2000), Mary Oliver invokes the image of the poem wanting to flower, "to open itself / like the door of a little temple / so that you might step inside and be cooled and refreshed". 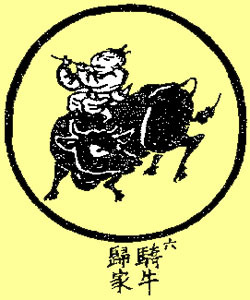 The Chinese character for poetry, shih (shí) is composed of two parts: yen (yán), words and szu (sì), temple. Hence, good poetry is an expression of the sacred, serving to enlighten our mind. La is the 6th tone of the diatonic scale in solmization: Do, Re, Mi, Fa, Sol, La, Ti, Do. It is the syllable sung to this note in a medieval hymn to St. John the Baptist. Webster Dictionary gives a second definition for "La" "interjection used for emphasis or expressing surprise". When we read the entire quatrain where this line comes from, we can feel the "Ah ha" moment of the 15th century Japanese monk's spiritual awakening when he wrote: For twenty years I've sought the Other. / Now, letting go, I fly out of the pit. / What use oneness of mind and body? / These days I only sing la-la-la. (from Zen Poems of China and Japan: The Crane's Bill, Poem 84). In the Analects of Confucius, XI.25, we find a similar story. Confucius asked his four disciples about their aspirations. Tzu Lu wished to be a minister commanding 1000 chariots. Ch'iu wished to teach people rites and music to make the state prosperous. Ch'ih wished to be a minor assistant to a shrine. Tien replied last: "Mine is different and cannot compare with the other three. During late spring, I would like to bathe in the River Yi, enjoy the breeze at the rain altar, and sing before returning home." Confucius sighed, lamented and said, "I am with Tien." So this poem which starts with splendor of the Emperor's palace, of things purple, the symbol of royalty ends with the image of a monk singing in the stream. And Confucius would join this chorus of the simple life rather than the comforts of the Emperor's court. This is my answer to Seung Sahn's Koan 84: "Whose Song Do You Sing?"